...Who Will Be Winners and Who Will Be Losers in the Coming Sea Change? On April 29, 2013, the Mauna Loa Observatory in Hawaii made a startling find: for the first time in human history, CO2 concentrations in the earth's atmosphere had climbed above 400 parts per million. Just one more data point marking the dawn of the Anthropocene era. .
We are in the Age of Man. In case you missed it, there is growing agreement that we are now living in a new epoch: the Anthropocene era, or the Age of Man. Having just recently returned from the Monterey Bay Aquarium Sustainable Seafood Institute, it’s clear that the Anthropocene era is bringing a change to the seas, too. First, some facts to bring you up to speed on the state of our plate in 2013 when it comes to fish. Seafood is the largest traded food commodity in the world. 86% of the seafood we eat is imported. 50% of imported seafood is from aquaculture. According to a report by the World Health Organization (WHO), 2012 marks another major milestone: for the first time in human history aquaculture is expected to outpace wild stocks as the top source of the seafood. Over 1 billion of the planet’s inhabitants in developing countries rely on seafood for high quality protein. There will be winners and losers in climate change. Read on to see who they are. Here’s what else was clear at this year’s Institute: a suite of factors is driving unprecedented change in ocean chemistry. Sea levels are rising as polar ice caps melt. 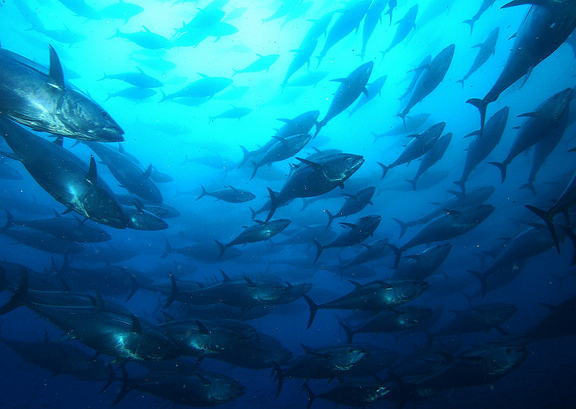 Ocean temperatures are hotter, so fish are moving-migrating towards both poles in search of cooler temps. Which means fleets have to travel farther, and fish deeper, to catch fewer fish. And tropical fish living near the equator are reaching their thermal maximum. While there are higher temps, there is also a lower pH (meaning an increase in ocean acidity) as carbon pumped into the atmosphere since the Industrial Revolution is absorbed by the oceans. According to Dr. Tessa Hill, a marine researcher from at University of California Davis (whose team grows sea creatures in conditions predicted in the next 100 years), mussels and oysters are already having a harder time extracting the minerals they need to make shells out of the water-resulting in smaller, thinner weaker shells that make them more susceptible to predators. Love oysters? Her research suggests that they may not be able to survive the coming changes. Jellyfish, on the other hand, are thriving in all of this change. As consumers at the top of the global protein seafood chain, what America buys at the seafood counter and in sushi bars are key leverage points in the system. Indeed, one of the big challenges is that it’s hard to grasp any of this from looking at your local fish counter or sushi menu. Here’s what you can do to help heal our oceans-and ensure that we preserve some of the planet’s healthiest protein sources for our children. The Fish Counter Is A Key Leverage Point. Try these 4 New Fish Now. Currently, more than 1/2 of the seafood we consume come from “the big 3”: shrimp, salmon and tuna. To give some of these species (as well as those, like Chilean Seabass, which have been overfished) a break, check out these 4 new delicious fish right now, from my latest Dr. OZ blog, to help heal the oceans and nourish your body. Monday I’ll share one of my favorite recipes with one of my favorite buys - barramundi - to get you started! Stay tuned!